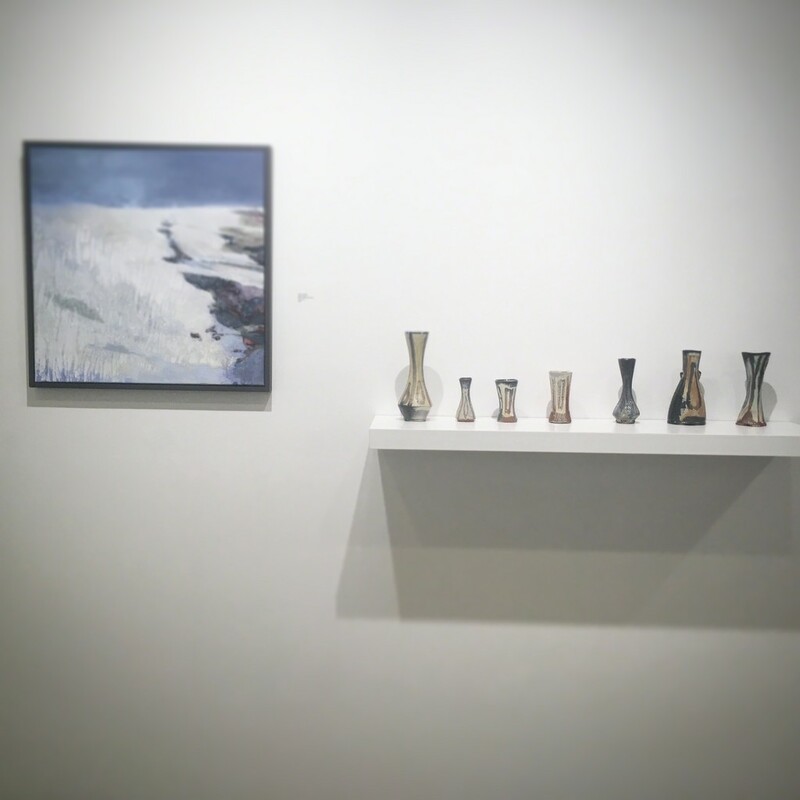 Paintings by Shar Coulson, mixed media work by Mandy Cano Villalobos, and ceramics by Lisa York. Working primarily with forms finished in the soda kiln, Lisa York creates ceramics for special occasion and daily use. The varied surfaces, line, and circle patterns on the work are inspired from travel and time out doors. 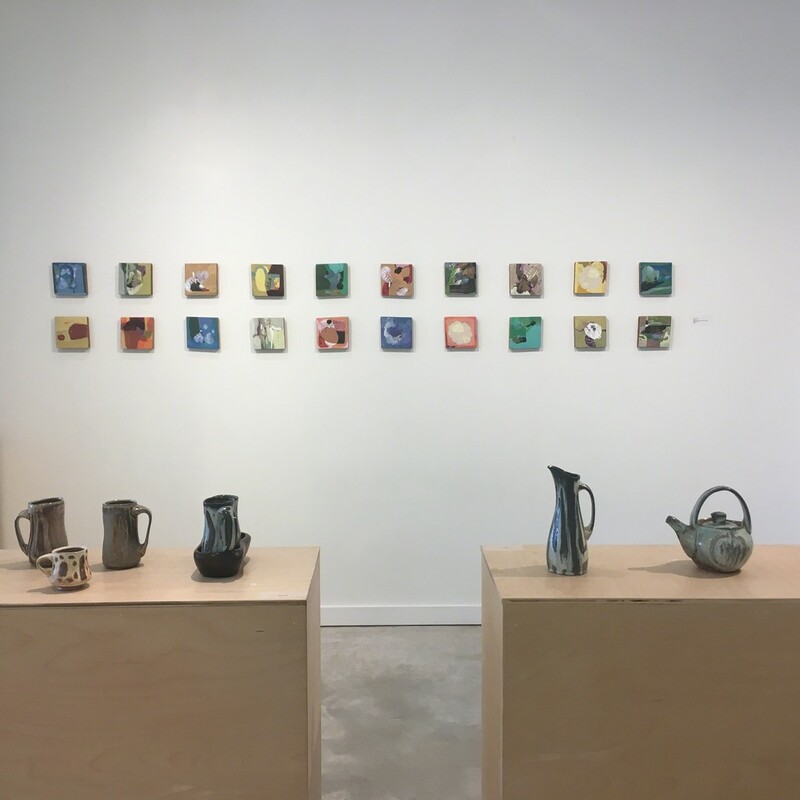 Her ceramic studio is located along the Mississippi River in Savanna, Illinois.York studied art at University of North Dakota, Hood College, Houghton College, and apprenticed with Kevin Crowe at Tye River Pottery. She was an artist-in-residence at the Sanbao Ceramic Art Institute in Jingdezhen, China, the International Ceramics Studio in Kecskemet, Hungary, and the Residency for Ceramics, Berlin, Germany. In Tanzania, she started a ceramics program at of Neema Crafts, an organization that trains people with disabilities to become skilled artisans. Likewise, she worked with a similar program in Chichi, Guatemala for a short-term project. 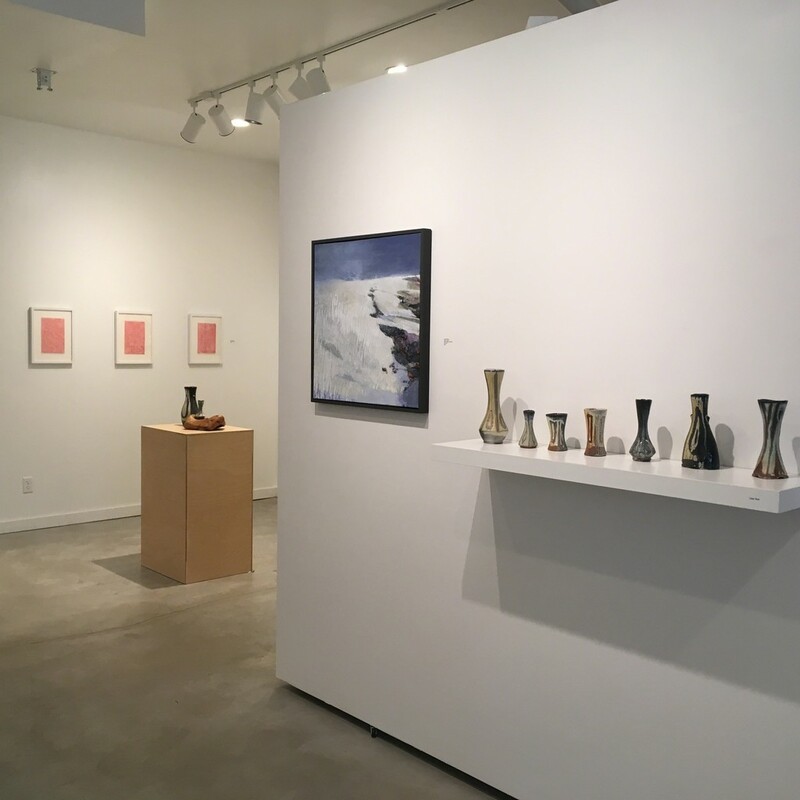 Her functional ceramics have been exhibited nationally and internationally. Embracing the essence of Organic Expressionism, Shar Coulson's work reflects her love of nature and the human figure. Working from visual memory, Shar explores the idea of perception vs. reality within the allusive figuration, gestural line work and organic forms found in her paintings. She was formally trained in classical figurative realism, yet finds her passion runs deepest in the world of abstraction. Her sensibility is also deeply informed by a successful career as a designer and executive creative director. 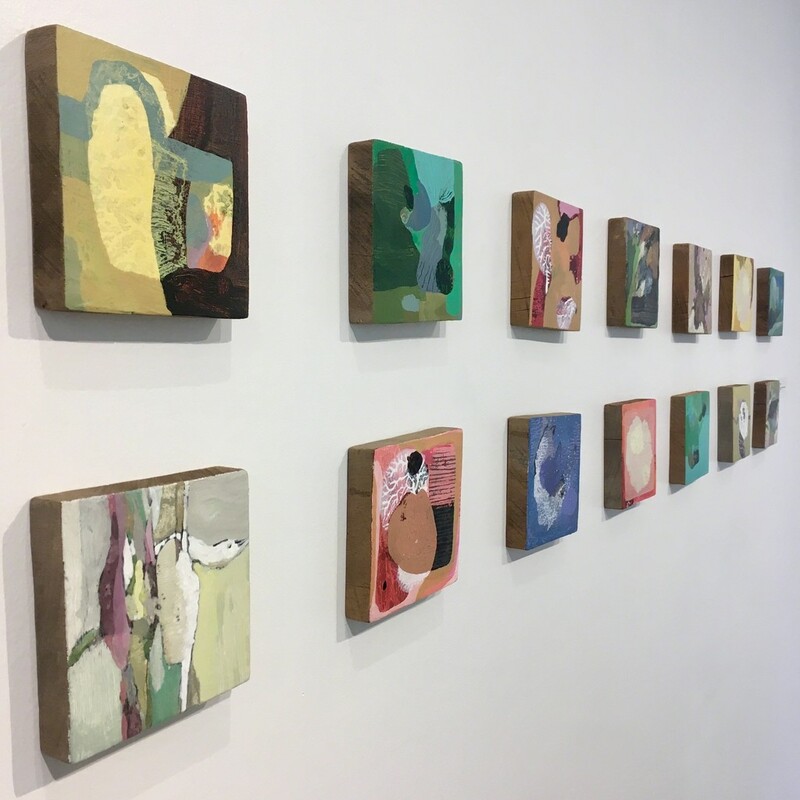 Shar is a founding member of the Chicago Art Salon and has exhibited internationally. She lives in the Near West Side Market District of Chicago, IL. Mandy Cano Villalobos is an interdisciplinary artist whose practice encompasses installation, performance, and object/textile-based work. Her versatile projects center upon notions of life’s ephemerality and identity shaped by location and culture. Cano Villalobos’ work has been featured in numerous venues including Van Der Plas Gallery (New York, NY), the Ruth and Elmer Wellin Museum (Clinton, NY), Maryland Institute College of Art (Baltimore, MD), the Ukranian Institute of Modern Art, (Chicago), The Museum of New Art (Detroit, MI), Hillyer Art Space (Washington, DC) and La Casa Pauly (Puerto Montt, Chile). Cano Villalobos has been an artist in residence at Vermont Studio Center, Post Contemporary, Wassaic Project, Ragdale, and ACRE. She has also received grants from multiple organizations including the Puffin, Frey and ISE NY Cultural Foundations. Her work has been reviewed in The Washington Post, Sculpture Magazine, Hyperallergic, Culture hall, Performa Magazine and Bad-at-Sports, among others. Cano Villalobos received her MGA from The George Washington University in Washington, DC. and currently resides in Grand Rapids, MI.